FIELD-MARSHAL DOUGLAS HAIG Portrait Signed. British soldier and Field Marshal. Commander of the British Expeditionary Force in WW1. Offset-litho photographic portrait of Douglas Haig, mounted on post-card with autograph signature on mount below image. The signed portrait shows Haig half-length in Field Marshal's uniform. 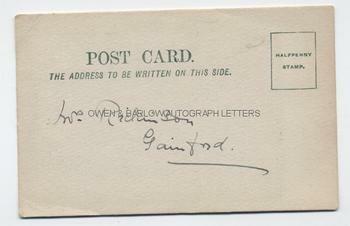 The post-card is addressed on the verso to Mrs Rickinson, Gainford. 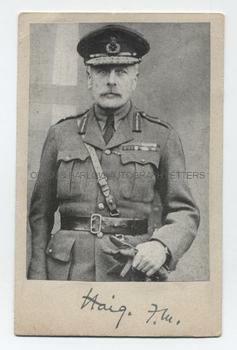 Douglas Haig commanded the BEF from 1916 to the end of the war in 1918. He was an extremely able and accomplished General but history will remember him as the man who commanded in the Battle of the Somme, the battle with one of the highest casualty rates of any in British military history. Over two million men were casualties under his command, including those lost at the Battle of Ypres and the "big push" of the Hundred Days Offensive. He, along with those commanding the Germans and the French, was essentially a 19th century soldier who was faced for the first time with the destructive might of modern weaponry used on a mass scale. Douglas Haig was, however, declared a national hero after the war and his tactical awareness and adoption of some modern methods and practices eventually led to victory. A key autograph in 20th century military history.